Sepang Gold Coast Sdn Bhd (SGC) is optimistic of generating a revenue of between RM20 million and RM30 million from the operation of its Golden Palm Tree Resort. The RM300 million resort, which will open for business in Bagan Lalang, Sepang, end-June, is 80 per cent sold to European and Middle East buyers. "We expect to chalk up a revenue of between RM20 million and RM30 million in the first six months to a year of operations. "The work progress is in the final stage. About 90 per cent is complete. We will hold a soft launch soon to give an opportunity to the public to view the resort, said SGC General Manager Francis Lee in an interview with Bernama recently. Golden Palm Tree (GPT) water villa is the first phase out of the three-phased Sepang Gold Coast city development project, the longest paradise in Asia. The coastal city development by SGC is a joint venture between Permodalan Negeri Selangor Berhad (PNSB) and Sepang Bay Sdn Bhd, a private investment holding company. The GPT resort is made up of 393 water villas, built in the shape of a palm tree, stretching 1.2 kilometres into the Straits of Malacca. Lee said buyers were guaranteed a seven per cent return on the net purchase price per annum for seven years. "At the beginning, SGC is looking at a 30 to 35 per cent occupancy rate. Overall, we expect an annual increase of between five and 10 per cent with locals and Singaporeans making up 50 per cent of the patrons to the resort," he said. The second phase of the Sepang Gold Coast project called Escapade will consist of activity areas, restaurants and clubs that will kick off for construction next month and be completed by end-September. Meanwhile, work on the third phase of the sea tropics project resort, costing RM300 million, will begin in September. Lee said it was very challenging to promote a place like Bagan Lalang as it was not well-known even among Malaysians. "So, we are putting a lot of effort to promote the resort through local and foreign travel agents besides traveling to other countries to participate in related events to establish the name," he said. Although SGC was still new and in the process of penetrating the market for recognition, Lee was confident the entire project when completed in 2012, would be another landmark for Malaysia after the Petronas Twin Tower. 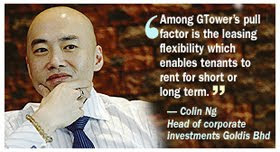 "Bagan Lalang is a quiet place but it will develop rapidly as the momentum pick ups once the GPT resort is open. "Although the GPT resort caters for the high-end market we are confident this project will be a great success for SGC and Malaysia," he reiterated. PENANG’S UNESCO world heritage site will soon boast of having the country’s first ‘cultural hotel’. Property owner K.H. Seah said three pre-war houses along Jalan Pintal Tali would be restored and re-opened as a high-end hotel to be named ‘1881 Chong Tian Cultural Hotel’. “These triple storey buildings, which have been around for over a century, is located in where I hope to develop as Penang’s Chinatown. “We want to revive that area and make sure that it becomes a living heritage,” he said in an interview yesterday. Seah, who owns a stretch of 13 other heritage houses in the area, said he would refurbish the other premises which he planned to rejuvenate and promote as Chinatown. “We have Little India and the Malay Kapitan heritage enclaves here but no Chinatown. “This cultural hotel will be a start for us to create a specific area where everyone can come and learn about Chinese culture,” he said. Work on the cultural hotel will start at the end of the month and is expected to complete by the end of the year. Seah said he was hoping to get the Unesco Conservation Award for his efforts, adding that the uniqueness of the cultural hotel was that it would have a library, mini cafe and museum featuring extensive antique collections dating back to the 18th century. “I am an antique collector and have received many pledges from other collectors to help stock up the library and museum. “The library resources and exhibition area will be free for everyone because one of our main objectives is to propagate the Chinese culture brought here by our ancestors,” he said. Seah and his partners have invested RM2mil to purchase the three lots and will need another RM1.5mil to refurbish the place in accordance to heritage guidelines. “The interior is termite-infested and there are trees growing within the building causing the structure to crack. “Think City Sdn Bhd, a subsidiary of Khazanah Holdings (a federal investment arm), has agreed to assist with the funding,” he said. “They will meet on Wednesday to decide on how much allocation the project will receive,” he said. Cultural Heritage Advisory Group member and project consultant Tan Yeow Wooi said the 19th century buildings had many unique features including Venetian windows and intricate Chinese motifs of peonies, dragons and cockerels on the facade. “There is also a very nice Cantonese-style sliding door with intricate carvings,” he said. PERDANA ParkCity Sdn Bhd, a subsidiary of the timber-based Samling group, has shortlisted seven companies, including one from Japan, to build a RM250 million hospital in Desa ParkCity in Bukit Menjalara, Kuala Lumpur. They are Sunway Construction Sdn Bhd, Crest Builder Holdings Bhd, Putra Perdana Construction Sdn Bhd, UEM Construction Sdn Bhd, Bina Puri Construction Sdn Bhd, Ahmad Zaki Construction Sdn Bhd and Japanese construction giant Obayashi Corp.
Sources familiar with the plan told Business Times that tenders for the 10-storey, 300-bed hospital, to be known as Sime Darby Medical Desa ParkCity, will close this Friday. "Perdana ParkCity will award the contract in April or May based on merits, technical expertise and track record. Construction will start by May or June, and be completed in 2012," one source said. Perdana ParkCity group chief executive officer Lee Liam Chye declined to comment when contacted. It is understood that the proposed hospital will be built on a design, build and lease concept. It is expected to begin operations by early 2013, a year later than initially planned. It will cater for the Desa ParkCity township and nearby areas such as Kota Damansara, Damansara Perdana, Bandar Sri Damansara, Mutiara Damansara, Bandar Utama, Taman Tun Dr Ismail, Sri Hartamas, Mont'Kiara and Bukit Damansara. The source said the new hospital, which will have 60 specialist clinics and six operating theatres, will be leased to the country's largest conglomerate, Sime Darby Bhd, for 20 years. It will be the third full-fledged hospital operated by the Sime Darby group, which is looking to grow its healthcare business to ride on the recession-proof medical industry. The group currently owns and operates the 393-bed Sime Darby Medical Centre (previously known as the Subang Jaya Medical Centre) in Subang Jaya and the Sime Darby Specialist Centre Megah in Petaling Jaya. It also owns and operates the Sime Darby Nursing Health and Sciences College managed by Sime Darby Healthcare. Perdana ParkCity is the master developer of the 192ha Desa ParkCity township, which will have some 7,300 residents when completed by 2015.